So, you have just purchased your Mac Mini and you would like to have the perfect monitor to match your cute little 6″ by 6″ Mac that is versatile enough to act as a LCD TV. Consider Apple’s Cinema Display range of monitors. All of them matched the Mac Mini very well down to the color and curvature. With 4 million pixels in the 30″ monitor, it gives you enough space to work on the Mac and watch movies at the same time. Talk about killing 2 birds with one stone. The hinges that supports this display can be “unhinged” so that you can mount it directly on the wall. This is great if you have limited space in your room or study. Using an industry-standard DVI (Digital Video Interface), you can use this display as a second display or use it on your personal computer. DVI connections ensure that you get crystal clear displays with full clarity and sharpness, all the time. Each Cinema Display monitors come with 2 FireWire ports and 2 USB 2.0 ports. This adds more flexibility for you if you have more devices to connect to your Mac Mini. You can have a choice of 20″, 23″ High Definition or 30″ High Definition Apple Cinema Displays. 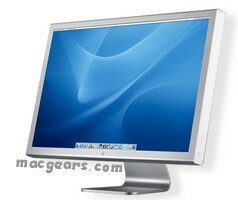 For more information about Apple’s Cinema Display, please visit Apple’s web site. Tell me about cheaper display. If any one buy mini in 35000 Rs why can he buy cinema display. He should go for iMac. Tell me about best completable display.